Do lots of volunteer stuff for beekeeping. That class seems so amazingly cool, and it sounds like the prof wants people who are willing to help. I don't have a truck, but maybe there's stuff around campus I can do. 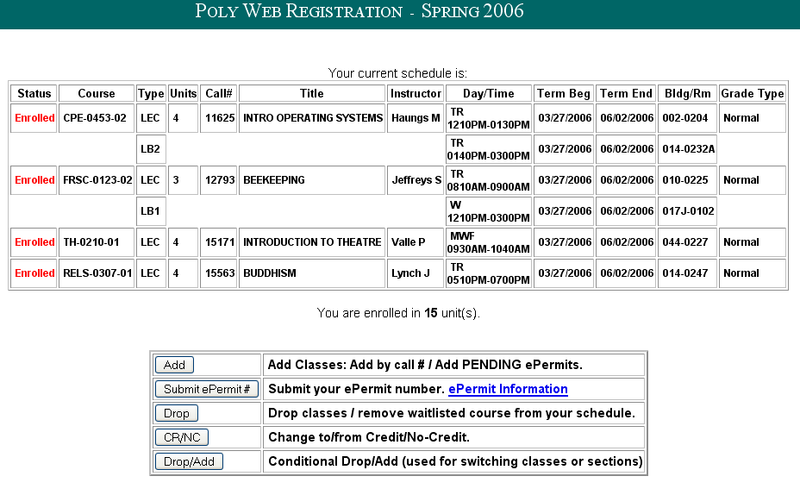 Maybe renew my "membership" with Cal Poly's Darkroom and work on fixing my pinhole camera. The big annoyance is transport, but I have a few ideas. Of course, I need photograph ideas, which are even harder. I've also been thinking that I really miss Summer Vacation from High School. I haven't really had an extended "break" of any sort since the summer of my freshman year, and I certainly don't think I'll get one when I start working. Work might be a bit relaxing though, since I won't have to be as concerned about bills as I am now. It could be interesting if I play with brewing as much as I want to. I'll have to hassle someone to help me out with stuff though. I think what I really need is to start carrying a to do list, so that whenever I get bored and frustrated, I at least have someone to see what exactly needs to get done. I've tried it in the past, but always lose it. Maybe the first item should be "don't lose to do list." Earlier in the quarter I almost mocked my roommates computer problems, and I blissfully was able to use my PC. Now matters have come full circle; on Sunday my PC could not boot into Windows, and some of my "quick" attempts to fix it have left it inoperable. I suspect the problem is the video card, a tragedy because the card isn't even a year old. I'm coming to find I loathe video cards for all the trouble they give me. If my tax return comes sometime soon, I may be able to get a new one, but that's an expense I'm hoping to evade. All of this may be a hidden blessing though, as it prevents me from playing WoW, which is probably too big of a time-sink. Meanwhile, I've been dealing with more little annoyances over the break. I rented Jacob's Ladder two days ago, and Blockbuster's copy appears to be scratched bad enough that the house DVD players have trouble reading it. On the more pleasing note, I caught the end of Eternal Sunshine and really would like to watch the whole movie. My IPA is nearly done with primary fermentation. I may have to buy a second batch of bottles as the IPA will probably be ready for bottling about the time my porter is drinkable. Oops! I guess it can never hurt to have more bottles, hopefully they won't be too expensive. I really need to clean up around the house this week; I'd really like to get my own things as in order as I can to make moving out in three months go smoothly. I haven't touched this thing in too long. I changed things back to a default blogger layout because I never really got around to making the layout I was using into what I wanted it to be. Perhaps I'll get around to that later. This post is likely very stream-of-consciousness-like, and I promise I'll try not to do that with other posts. I've started brewing beer. I'd like to do something along the lines of what Lyle did on his website, but I think it'll have to wait a while. I suppose I shouldn't wait too long, as the fermentation process takes a while and I think I have about two more batches in me before I'll be cutting it too close to graduation. I think the most important course on there is Fruit Science 123, a.k.a. Beekeeping. That class will either rock or kill me. I'd like to (but probably won't) get a bunch of honey to make mead with for after I graduate. What will likely happen is that I'll know more about what I need to ask for from an apiary when I get to Washington. Meanwhile, my Senior Project is killing me. What was supposed to be the easiest thing in the world after coming back from Germany is quickly turning into a much bigger hassle than I expected. It's my own fault for slacking on some things, and I really hope to be done with the annoying parts soon. Then I can get back to more entertaining things.